Fall is my favorite season of the year and so it stands to reason, pumpkins play a big part in both my garden, crafts, fall decor, and food! A few years ago, I visited an Atlanta garden where colorful pumpkins were scattered throughout the landscape, adding fun fall interest. This year, I added uncarved pumpkins in empty containers for added interest by my front entry. Next year, I will probably add more near the vegetable garden as well as other places. My personal pumpkin growing experience has been rather lackluster. This is the only pumpkin that I’ve successfully grown. It was years ago and I’ve only made rather half-hearted attempts since then. I do have plans to plant some new ones in late April, which means that they will ripen in mid to late July. Then I will store them in a cool, dark, dry space until October. On October 1st of every year, I bring out my homemade pumpkins, which I made over 6 years ago. They are made from beach balls and newspaper dipped into a flour paste. It was a fun project that I did with my mother and I’m so happy that they are still a part of my fall decor years later. This past week, I was visiting my oldest daughter in northern Michigan, which I try to do at least three times a year. As we were walking in the small downtown district, we came upon this comical bank robber who was caught in the act of robbing the bank. I loved the ingenuity of those who created this scarecrow with a pumpkin head! Last year, once Thanksgiving was over, I sliced our remaining pumpkins in half and placed them on the old picnic table in our side garden. The birds flocked to them and we had six different types of birds visit them regularly, eating the seeds and flesh inside. At one point, there were twelve Inca doves sitting inside of the largest half. I will be sure to do this again in a few weeks as it is so fun to watch the antics of the visiting birds. To finish out my pumpkins post, I have to include a photo of my famous pumpkin bread that I make every year. This is my most-requested recipe from my friends and it is so easy to make and oh so delicious!!! The recipe is unique in that there are no eggs and the texture is so moist and perfect. It makes 6 small loaves, making it a great home-baked gift at the holidays. If you would like to make this delicious pumpkin bread, here is a link to the recipe along with its rather unusual origin story. How do you like to use pumpkins in fall? https://www.azplantlady.com/wp-content/uploads/2018/11/pumpkin-scarecrow-robbing-bank.jpg 660 800 arizonaplantlady@gmail.com http://www.azplantlady.com/wp-content/uploads/2018/10/favicon.png arizonaplantlady@gmail.com2018-11-05 07:05:272018-11-04 18:06:26Pumpkins!!! While most of the garden is asleep in winter, citrus trees are filled with sweet, tart fruit ready for picking. Citrus trees are very generous in the amount of fruit that they produce. So much so, that people are often inundated with more citrus than they can eat. This time of year, people find bags and even boxes of freshly-picked citrus left at their door by neighbors who are happy to share their bounty. So, whether you have boxes of citrus or have to run to the grocery store for your favorite lemons and oranges – here are some creative ways that I use citrus. 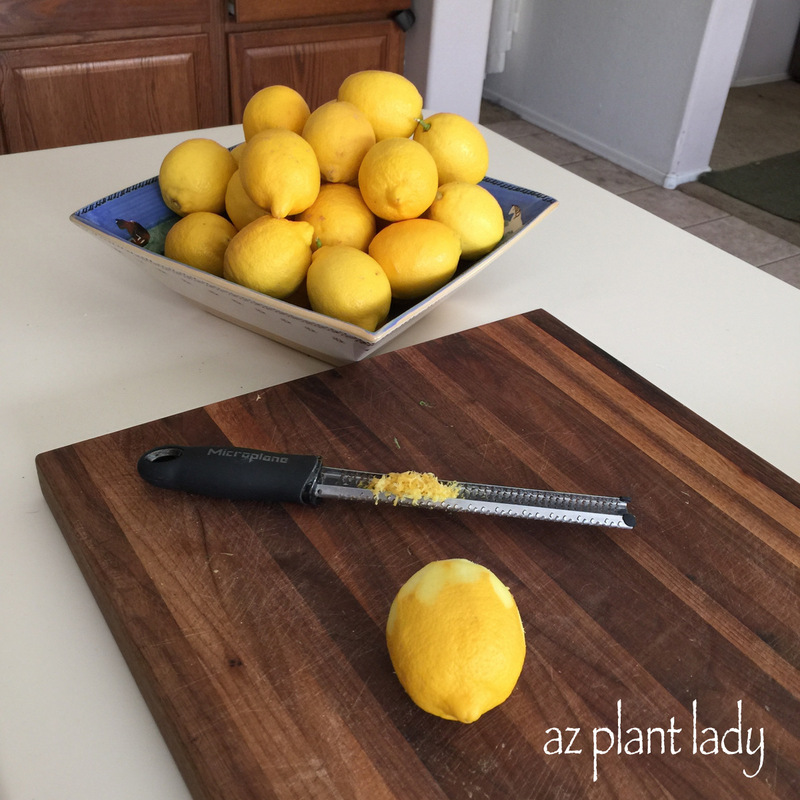 Lemon zest adds great flavor to your favorite foods and it is easy to freeze. Simply put the lemon zest in a plastic freezer bag and keep in the freezer for up to a year. The fresh scent of lemon is welcoming when you walk into a room. Instead of using artificial air fresheners, you can use citrus to create natural ones. Ingredients such as basil, lemon slices, and peppercorns OR orange slices with vanilla create wonderful fragrances. Add the ingredients to a small pot, fill to 3/4 full with water and heat to boiling. Then reduce the heat to the lowest setting and enjoy the fragrance for the next couple of hours. Click here for more information and combinations for natural air fresheners. Citrus peels and vinegar combine to create a natural citrus cleaner that is suitable to use around the house. You will need the peels from any type of citrus and white distilled vinegar. – Fill a large jar (or container) with the citrus peels and fill the jar with vinegar. – Store in a cool, dark place for 3 weeks. – After 3 weeks, pour the mixture through a strainer to remove any pulp. – Transfer the citrus/vinegar mixture to a spray bottle, filling it halfway. Add water to fill the rest of the spray bottle. – Your natural citrus cleaner is ready to use to wherever vinegar-based cleaners are safe to use such as countertops, walls, faucets, mirrors, and glass. Don’t use on granite or marble as the vinegar can etch the surface. *The peels can be frozen for use later. An easy way to preserve lemons from your tree when the fruit is but a distant memory – add lemon juice to ice cube trays and freeze. 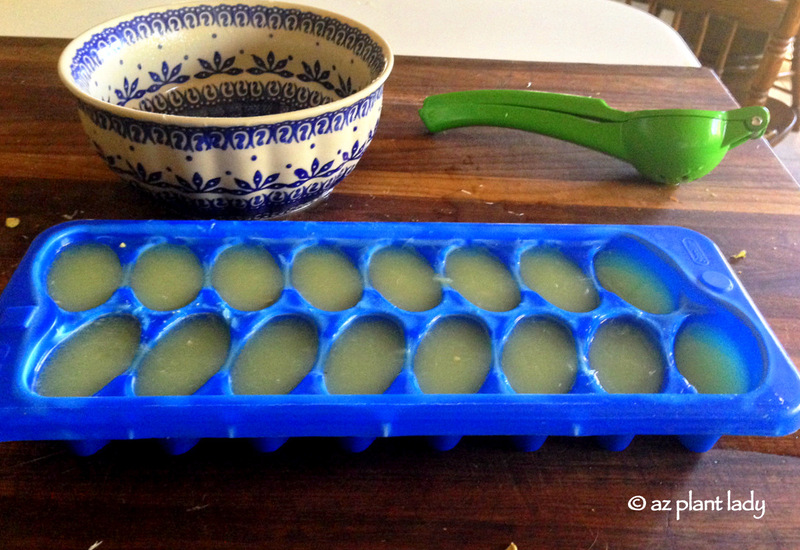 Once frozen, pop out the lemon ice cubes and place in a plastic freezer bag and store for future use. 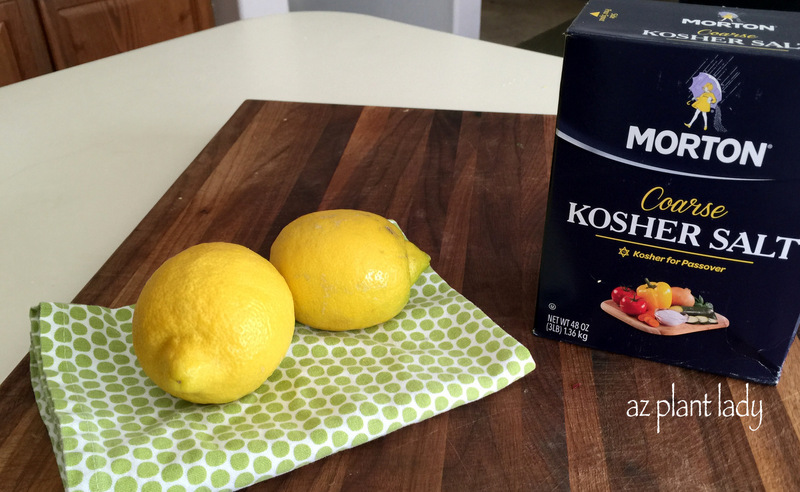 These ice cubes are a great way to add lemon when you cook throughout the entire year. If you love to cook, lemon salt is a great way to add subtle lemon flavor to your favorite dishes and it’s easy to make – all you need is kosher salt and lemons. 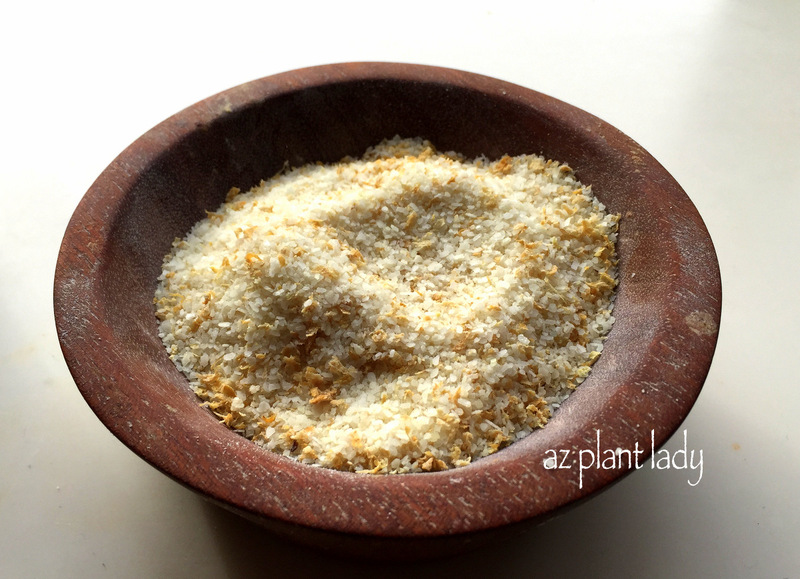 I made lemon salt last year and it is delicious – I promise, you’ll love it. Click here to see a step-by-step tutorial. Do you have any ways that you like to use citrus? We’ve reached the final day of our garden gift lists and today, it’s all about kids. Gifts with a garden theme aren’t just for adults; there is no better way to foster the curious spirit of children and lead them on a path of discovery about the natural world around them than the gift of a kid-sized kit with a garden theme. As a mom and grandma, I’ve enjoyed countless hours with young children as they learn about plants and insects. Here are some gift ideas for the young people in your life. Foster a love for vegetable gardening by showing kids what goes on beneath the soil. They plant a carrot, onion, and radish seeds and watch the roots develop at the same time that the leafy tops grow. Click here to learn more and purchase. Join with your kids as you view the miracle of caterpillars transform into butterflies. All you need is inside this best-selling kit, except for the sugar water. I wrote about my experience of doing this with my kids. Needless to say, they loved it! Click here to order. Terrariums are fun for both adults and kids alike, allowing them to view a self-contained world. I like that this kit has all you need to make your own while learning about plants and how they grow. My 6-year-old granddaughter, Lily, asked for this for Christmas. Click here to order. Imagine the delight of your kids when they see little mason bees making their home in this little bee house. Mason bees are important pollinators and don’t sting, making this a safe and fun gift. Click here to order. Young children like to work alongside adults in the garden, so how about getting them their own set of kid-sized tools? Believe it or not, we bought this when my 32 and 23-year-old daughters were little, and they used them often. All of the tools lasted a long time. In fact, we still have the little shovel! Click here to order. The right garden gift for a child can foster a lifelong love of gardening, and you can be the one to begin them on this journey. This concludes my Four Days of Garden Gifts. If you missed any of them, here they are – Day 1, Day 2, and Day 3. Pumpkins play a large part in our fall holiday celebrations. I remember trips to the pumpkin patch when my kids were younger and watching them choose just the ‘right’ pumpkin for our family. A few weeks later, pumpkins take center stage on Halloween as their artfully carved faces add a festive element to costumed trick-or-treaters. But, what do you do with them once the holiday is over? Instead of throwing them in the trash can, what if you could find new uses for your pumpkin? Whether your pumpkin has been carved or left whole, I’ve shared 9 ways to reuse them in the garden and in the home, in my latest article for Houzz. I hope you enjoy! Do you grow herbs? I do. Herbs are easy to grow and thrive in arid climates and shrug off the heat. I’m the first to admit that I don’t like messing around with fussy plants and so herbs fit right in with my gardening style. Toward the end of summer, my garden is overflowing with herbs – especially basil. I certainly have more than I can use right now, so I like to preserve my herbs in a variety of ways so that I can enjoy the fresh flavor of summer throughout the winter months. One of the easiest ways to store herbs is by freezing them using olive oil or water. You can see my post on how to freeze herbs here. Herb salts are a newer way to keep the fresh flavor of herbs alive. The ingredients are simple, and they are a unique way to add a delicious taste to your favorite recipes. See how easy they are to make in this blog post. Finally, the most popular method for preserving herbs is to dry them. Some types of herbs are easier to dry than others, and there are different methods for drying herbs. I invite you to read my latest article for Houzz.com where it’s all you need to know about drying herbs. I hope you enjoy it! Do you dry or freeze your herbs? Which herbs work best for you? Have you ever visited a garden filled with more than just trees and plants? Different types of garden art can add welcome interest to outdoor spaces along with a touch of whimsy. It’s the unexpected element of encountering an unusual planter, wall hanging, or recycled items throughout the garden that can add a touch of whimsy that makes a garden unforgettable. I was inspired by the creative uses of garden decor on a recent visit to Buffalo, and while the plants may be different than what I grow in my Arizona garden, the look can be easily replicated using desert-adapted plants. Here is a look at my favorites. A small bistro table is all set for tea along with moss planters in the shape of a purse and high shoe. Got a dull expanse of wooden fence? Grab some chalk and draw some flowers – this would also work for a block wall fence too. Old glass dishes make beautiful flowers, don’t you think? Got an old portable fire pit? Dress it up by filling it with succulents. Creating artistic pieces from old silverware is quite popular and I quite like this dragonfly made out of butter knives. An old mirror not only makes a unique wall hanging, but it also reflects the beauty of the garden in front of it. Old garden benches paired with old watering cans add a new look to this corner of a garden. Transform an old tree stump by adding a plant on top and wooden planters below. ‘Head’ planters are a trendy whimsical element, and I love the extra splash of color that these add. Elephants food (Portulacaria afra) would make an excellent ‘hairstyle’ for a head planter. The elegant beauty of a rusted steel hummingbird. Faced with the view of an uninspiring blank wooden fence? Break up the monotony by adding planters across the base and through the middle. Succulents would look great used this way through the middle with potted lantana at the base. An antique store kettle finds new life as a planter for purple alyssum. Cool season annuals such as petunias or pansies would go nicely in here. Succulents are a good choice for a year-round planting. Metal wall hangings are a great way to decorate vertical spaces. Another stump makes a suitable resting spot for a couple of birdhouses and a colorful ladder. A simple, yet elegant way to display the blooms in your garden in small glass jars. Lantana, roses, Texas sage or yellow bell blossoms would look lovely displayed like this for a party. Are you feeling inspired? I certainly am. I invite you to stroll through an antique shop, a thrift store, or even the garage sale down the street. You never know what will catch your attention and be used to add artistic flair and whimsy to your garden. Have you ever seen the beauty of cactuses showcased in containers? Adding a cactus to a container helps to set it apart from the rest of the landscape and helps it to stand out so that its unique texture and shape really stand out. However, if the thought of having to plant a prickly cactus yourself has given you second thoughts about doing it yourself, it isn’t as hard as it seems. Let’s take a closer look at how to plant a cactus in a pot. I have planted my share of cactus in the past, usually without getting accidentally stabbed with the spines. My method of choice was to use an old towel to cover the cactus while I removed it from its pot and planted it. However, on a recent trip to B&B Cactus Farm in Tucson, I was able to observe an expert plant my newly purchased cactus. Whenever I find myself in Tucson, I try to find time to visit this cactus nursery, which has a large selection of my favorite type of cactus. Torch cactus (Trichocereus hybrids) are rather unassuming when not in flower, but are transformed when their large blossoms open, several times in summer. I first traveled to B&B Cactus Farm last year with the intention of buying one torch cactus. However, as often happens with me and plants, I came home with two, including this stunning ‘First Light’ torch cactus. This time, I decided to buy one more torch cactus hybrid – unsurprisingly, I bought two again as well as a colorful container to plant one of them in. I had planned on planting it myself once we returned home, but a conversation with one of the cactus experts changed my mind. We had a great time talking and I decided to have him pot my cactus, which would make it easier to transport home. When I explained that I had a gardening website and wanted to take a video of him potting the cactus, he graciously agreed and provided lots of helpful advice. I hope you enjoyed Damon’s helpful tips. For more helpful videos, subscribe to my YouTube Channel. It’s one of my favorite times of year in the garden – my peach trees are heavily laden with delicious, sweet fruit ready for picking. Many people are surprised to learn that you can grow peaches in Arizona, but they do very well. However, they do ripen earlier than in cooler climates. May is peach season here in the desert. My peach trees sit outside my kitchen window, and I’ve been keeping my eye on them to see when they were ready to harvest. Finally, the day arrived, and I brought out my bushel basket and got to picking. One peach tree can provide you with most of the peaches you need. Last year, I made peach blueberry jam, which was so good, that it didn’t last long. Today, I’m planning on making regular peach jam, but I can always buy peaches from the store at another time to make other variations if I choose to. Every May, I haul out my water bath canner, canning jars, and spend 2 hours making delicious peach jam. Growing peaches and making jam isn’t difficult or expensive, but there are guidelines to follow. I made a video of the process, from what type of peach trees do best in the desert, how to tell if your peaches are ripe, and how to make jam. I hope you enjoy! Do you like to use herbs to flavor your favorite dishes? If so, than you’ll want to try herb salts. So what are herb salts, you may wonder? They are created by mixing the herb of your choice with kosher or sea salt, which is used in place of plain salt to add delicious flavor to food. Herb salts are easy to create and make great gifts. I’ve made several different types of herb salts in the past and recently set out to make a batch of rosemary salt. Since I don’t have rosemary growing in my garden, I drove to my sister’s house to clip some fresh sprigs of rosemary from her garden. (You can also use fresh rosemary from the grocery store). You will need 3 1/3 cups of kosher salt and 1/3 cup of fresh rosemary along with a jar to store it in. 1. Rinse the rosemary sprigs in water. 2. Remove the leaves, starting from the top downward. 3. Put the rosemary and salt in your food processor and pulse until the rosemary leaves are approximately 1/8 of an inch long. 4. Place the rosemary salt onto a baking sheet and put in an oven that is heated to 200 degrees and bake for 30 minutes. 5. Let the herb salt cool and then put in jars with a lid. Rosemary tastes great on your favorite meat dish including beef, chicken or pork. I also like to sprinkle it on the top of buttered rolls – yum! While rosemary salt is delicious, it is just the beginning – there are other herbs that can be used to make herb salt. Basil salt is a great flavoring for Italian dishes such as marinara sauce or sprinkled on pizza. To learn how to make basil salt, click here. If you love cilantro, how about a sprinkle of cilantro salt on your favorite Mexican dish? Cilantro is one of those herbs that many people can’t get enough of. Click here for instructions to make your own cilantro salt. Whether you use herbs from your own garden, the farmers market or grocery store – they are a delicious addition to your pantry as well as a great gift idea for the ‘foodie’ in your life.